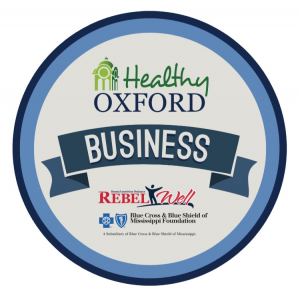 Oxford, February 2017: RebelWell continues to highlight Oxford businesses that make health and wellness a priority in the workplace. This month’s spotlight is placed on Barnes Law Firm, P.A. With additional offices in Jackson, Gulfport and Southaven, Barnes Law Firm, P.A. is an AV rated tax firm with eleven employees. Workplace wellness is a company-wide initiative for managing partner Trip Barnes. You can often see the firm’s Oxford attorneys and staff utilizing time during their work day to take in a run or brisk walk. Not only is mid-day exercise accepted, it’s encouraged. Because the long-term effects of sitting have been uncovered by recent studies, all offices within the firm have been outfitted with standing desks. Another wellness benefit offered to employees of Barnes Law Firm, P.A. is paid personal days and ample vacation time. The legal field is an especially stressful environment and Barnes Law Firm, P.A. recognizes the importance of down time. Barnes Law Firm, P.A. also offers an all-around supportive environment to not only their employees but also employee’s families. The overall support and wellness opportunities the firm makes available to employees is credited for long-term employee tenure. Barnes Law Firm, P.A. 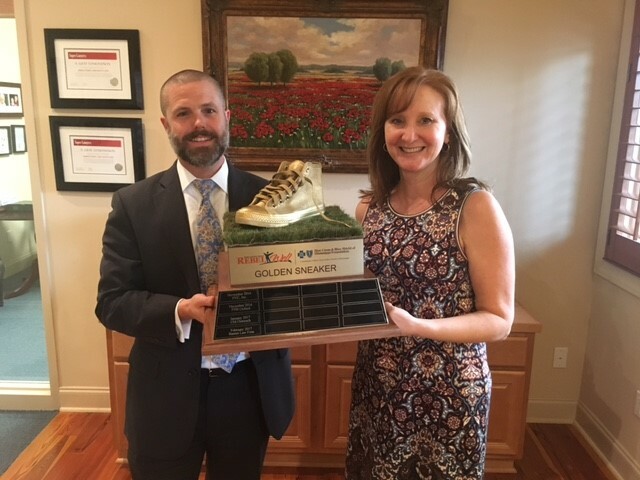 in Oxford will display the RebelWell Golden Sneaker trophy in the lobby of their building on the Oxford square for the upcoming weeks and permanently display the HealthyOxford|Business window decal signifying they are doing outstanding things in the wellness space. About Barnes Law Firm, P.A. With over 100 years of combined experience in Tax Law, Barnes Law Firm, P.A. specializes in the areas of Tax Problems, Estates, Estate Litigation, Buying/Selling Businesses, and Business Planning. Their approach to the practice of law is founded on developing an individual relationship with each client. With a goal of being large enough to provide effective legal services in complex areas of the law, but, not so large they lose touch with the individual needs of clients, they frequently work with CPA, Law, and Financial Firms as a member of their Client Services Team. With offices in Jackson, Oxford, Gulfport and Southaven, Barnes Law Firm, P.A. is the only Tax Law Firm in Mississippi that has been invited to join the prestigious International Association of Boutique Law Firms and the only firm in Mississippi that is a National Football League Players Association Registered Player Financial Advisor. Barnes Law Firm, P.A. is also AV rated by Martindale-Hubbell. Visit Barnes Law Firm online at http://www.barnes-lawfirm.com/.